We invite you to come aboard the 10th Anniversary Burlington Northern-Santa Fe Make a Wish train ride. You’ll be traveling in vintage cars with over 300 children and their families. Besides Comfort Dogs Phoebe, Pax, Elijah and Triton, you’ll find clowns, female superheroes, face painters, and balloon magicians. The cast is as endless as the fun. What a joy to spend time with these wonderful children and their families. 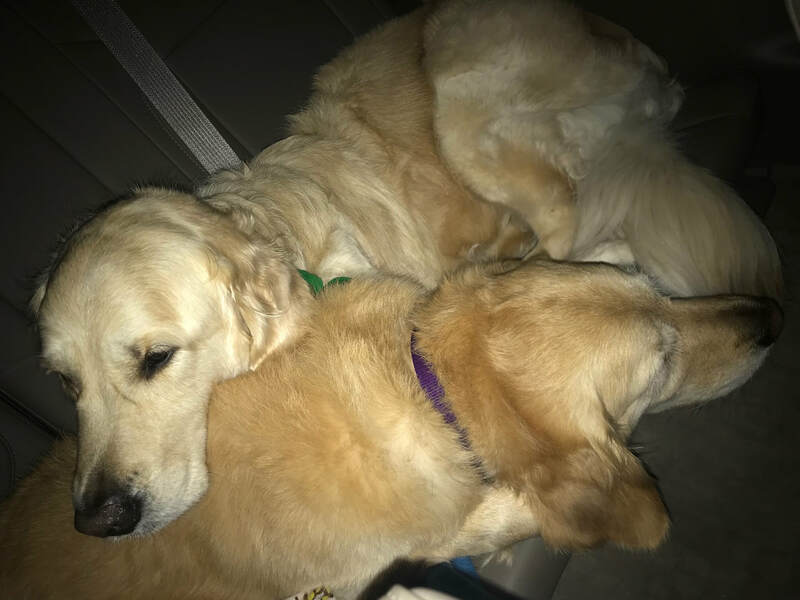 Pax and Phoebe cuddled up after a late night appointment. Keep up with the latest news by joining our email list below. Through the Kare-9 Military Ministry we have the opportunity to work veteran to veteran. We strive to serve our military, veterans and their families. Veteran handlers working with Kare 9 vested dogs have been able to engage members of the military community both active and retired. Phoebe and Pax are dual-vested enabling us to further spread this ministry. It has been our great privilege to attend Welcome Home events and visit Veterans' hospitals and living facilities. Join with other comfort dog teams throughout the U.S.